Warts are local growths in the skin caused by human papillomavirus (HPV) infection. There is more than one form of HPV and of particular interest is that Warts on the hands are caused by a different variant of HPV than say Genital Warts. Common warts occur in a variety of shapes and sizes and are extremely common in children. They are no longer treated on the NHS and shop bought remedies that involve freezing are known to leave scars. 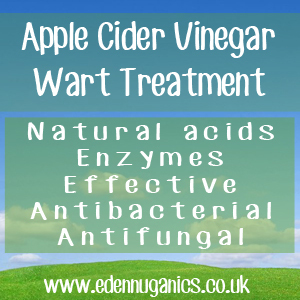 One of the most tried and tested natural remedies for the treatment of warts is the use of raw apple cider vinegar. Common Warts - Most commonly found on the back of the hand and fingers, common warts can appear singly or in clusters with a rough textured surface. Plantar Warts - Plantar warts are found on the feet and in many cases become painful, often impairing a sufferer's ability to walk for long distances. Flat Warts - These are commonly found on the face, arms or legs and differ from other warts as they lie flat on the skin and do not form a lump or abrasion. Filiform Warts - Similar to flat warts, filiform warts are found in areas including the mouth, nose and beard area and are often spread during shaving. Periungual Warts - These hard to treat warts are found under our finger and toe nails and appear as rough irregular bumps. How can Apple Cider Vinegar help with Warts? ACV is effective for the gradual removal of warts and although this process can take a few weeks, it has proven successful for many time and again. The natural acids in apple cider vinegar break down the walls of the wart and over time allow the vinegar to get right down to the root. At first, there may be some slight pain and stinging but this will pass once the Wart becomes black (this is a sign the vinegar is doing its job and your wart is dying). Raw, unfiltered apple cider vinegar. Patience, as this remedy will take around a week to remove your wart. The first step is to apply some raw apple cider vinegar to a small piece of cotton wool. Next, place the cotton wool onto a piece of tissue. Allow the tissue to absorb the excess ACV as we do not want it to be dripping wet. Place the tissue over the wart. Try not to cover healthy skin so only a tiny piece of cotton wool may be needed. Hold the cotton wool in place using medical tape or a plaster. Repeat this process twice a day until your wart falls off or can be easily removed. Once your wart has gone, it is a good idea to continue the use of ACV for a two or three day period to ensure the whole root is removed. Bananas - Yes, you read that correctly! There is growing evidence to suggest that the white pith found on the inside of banana peel can be used as an effective treatment for Warts. Bananas contain a 'Proteolytic' Enzyme that eats away at the wart. Basil - Basil possesses powerful antiviral properties and can be applied fresh to your Wart to speed up removal. It is best to use basil in combination with more powerful remedies. Although this remedy is fine for adults, the skin of children's hands is far more delicate and apple cider vinegar should only be applied for 4 - 6 hours a day to avoid discomfort. If your wart has not gone after 2 weeks we recommend talking to your health care professional.